The world is full of emotion. The open Solar Plexus takes in that emotion and can amplify, empathize and become that emotion. If you have an open Solar Plexus you are designed to experience the emotional energy from all around you, but you are not design to live this energy in a continuous manner.So maintaining balance with emotional energy is key to the health of the open Solar Plexus. People who are open in the Solar Plexus may resort to different tactics to work through the energy they take in. Some get caught in the drama of those around them. Rising and falling with the trials and tribulations. Taking on the battles or struggles the emotions bring. Others run for cover. They avoid emotions like the plague. They may in fact go so far as lying to avoid reliving an emotional event. Maybe that is why in general memory of the negative things fad more quickly with time. 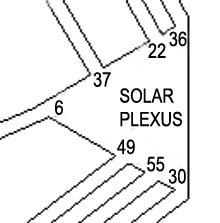 Maybe it is a built in survival mechanism for the half of the population that has an open Solar Plexus. If you have an open Solar Plexus your natural state is cool, not hyped up or down in the dumps. The people and events around you are swinging up and down, toward joy and happiness and sorrow and pain. You are designed to take in and feel that energy and then let it go. But most of you don’t live alone in seclusion like living in a cabin in the woods. The odds are 90% that you will form an emotional channel when you get together with 2 other people. This means that most people through work, school or home life are consistently under the influence of emotional energy. While emotions over time can provide clarity, to the open Solar Plexus they can cause disruption or discomfort. Visualize a protective layer around you or specifically covering your open centers. It can be anything that resonates with you: a screen; a bubble; armor; or bright light. The protection allows you to sense what is going on but does not take in the energy from around you. Use discernment. Emotional drama, especially involving a loved one can draw you in. Is it your drama or your fight? We all have lessons we need to learn. Lend a hand if it is warranted but don’t own the drama of others. Take a hike! Or a walk or get outside. If you are in a volatile emotional setting get outside and let nature help clear the emotional charges you may have taken in. Leaning against a tree trunk or standing on a large rock can be grounding and restorative to your balance. The world is full of emotion. It can be beautiful, melancholy, ecstatic, and sad and every shade in between. The open Solar Plexus can become extremely wise about the emotional world. Just be careful not to let it consume you.